outdoors and is treated as a holiday activity. Especially, Outdoor Christmas decorations holds a special place in people's hearts, as it is a reflection of their decorating style and the effort that is visible to everyone. 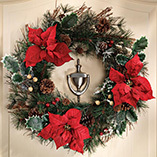 The outdoor Christmas decoration invites great appreciation and gives joyous pleasure to the visitors. 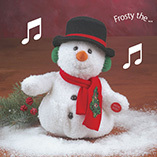 A smiling Red Snowman Door Mat will put a smile on all your guests' faces before they even enter your house. It looks really cute and is a merry way to decorate your entryway. It features a cheerful snowman all dressed for winter with his black top hat and a red snowflake scarf made up of coir with high quality acrylic paints, measuring 20"L x 22"W. A great Christmas decoration to add to your doorway! For the garden of your house, this detailed Cast Iron Snowflake Stepping Stone is a fabulous Christmas decoration. This stepping stone forms a geometric snowflake pattern perfect for winter decoration, both for indoors and outdoors. It measures 12' in diameter. 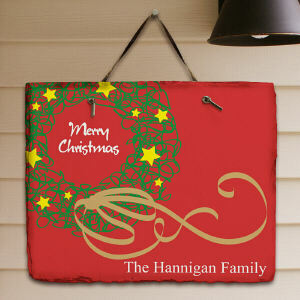 It can be used as stepping stone, wall décor or for adorning the dinning table. From the distance, this luminary candleholder looks like a present wrapped in red paper with a snowflake design. You can put a lit tealight inside, and watch this luminary shimmer create a magical effect to your entrance. You can also use this Red Christmas Present Luminary to light the stairs up to your front door during the holiday season. 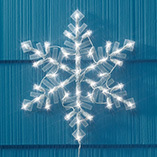 It is made up of metal and measures 10"L x 10"W x 14.25"H.
This is something different for outdoor christmas decorations. 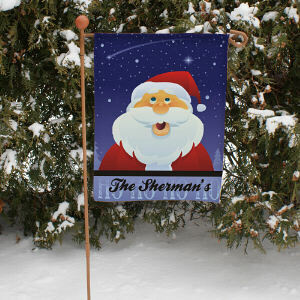 Cover your front door with this Jollier Santa Door Flag. Everyone will know that your household loves Christmas when they see this flag depicting Santa standing on a mound of snow with presents. The text "Happy Holidays" and the red and white border give this decoration an extra festive feel. It is made up of Polyester and measures 28"L x 72"H.
This is an interesting way to wish a merry Christmas to your neighbors with a Santa and His Crew yard decoration. It includes three reindeer pull Santa and his sled across the top of the whirling yard sign. This festive piece of yard décor will turn in the wind and will be sure to entertain you this Christmas season. It is made up of tin and iron and measures 29.5" x 10.75" x 50"